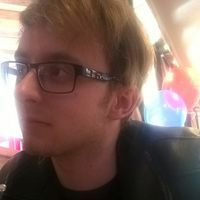 Josh Brookes first began his career in writing at the age of 4 with the many stories he based on Pokémon and dragons, developed his skills at 10 with attempts at high fantasy, and currently (at an age much older than 10 plus 4) writes urban fantasy, not based on Pokémon or Lord of the Rings. His first book, Daemnos, was published in 2015, and is the first in the Demon Souls series, which consists of a planned 6 books. To ask Josh Brookes questions, please sign up. This is the second book in the Immortal Souls series, following the lives of Sam and Jamie. I can’t even begin to express just how entertaining this book is. When the first one came out, I left a review stating my joy that I’d found a YA story with tw This is the second book in the Immortal Souls series, following the lives of Sam and Jamie. I can’t even begin to express just how entertaining this book is. When the first one came out, I left a review stating my joy that I’d found a YA story with two realistic characters who didn’t just instantly fall in love for no ****ing reason, and thankfully that theme continues both hilariously and frustratingly into this second volume. The dynamic between the two shifts continuously. Their relationship takes fresh turns that weren’t inexplicably forced on them, but turns that they have instigated themselves, like a real relationship between people does. MINOR PLOT SPOILERS HERE. FAIL TO SKIP TO THIRD PARAGRAPH AT YOUR OWN RISK! The plot continues to grow, as does the world. Although I don’t think it is explicitly explained in so many words, if you’re sharp enough to notice we finally see why Jamie has never been able to locate another vampire in his two hundred years of living. The shadows continue to surge, growing more violent, and a little ****er named Elliot is starting to prove he is not someone we should forget. We’d love your help. Let us know what’s wrong with this preview of Guardian Vampire by Karen M. Dillon. We’d love your help. Let us know what’s wrong with this preview of Wolf Island by Darren Shan. We’d love your help. Let us know what’s wrong with this preview of Harry Potter and the Sorcerer's Stone by J.K. Rowling. We’d love your help. Let us know what’s wrong with this preview of Fantastic Mr. Fox by Roald Dahl. We’d love your help. Let us know what’s wrong with this preview of Harry Potter and the Chamber of Secrets by J.K. Rowling.